This course is intended to assist the student in the development of Biblical and Theological foundations to understand and interpret a Christian view of reality, a Christian worldview. Attention will be given to worldview analysis, its relationship to learning, application to varied academic disciplines, and various issues in contemporary culture, including major non-Christian worldviews. This course supports first year students in transition from high school to college and is missioncentered with a focus on an in-depth orientation to the university community, development of skills necessary for academic success, and facilitation of community within the cohort. A Strengths' based academic recovery course designed to help students examine past habits and experiences in an effort to modify their approach to their overall educational experience in an effort to improve scholarship, performance, and satisfaction. Students will participate in classroom discussion, develop and commit to a detailed personalized plan for personal and academic success, and build a team of support designed to mentor and encourage their endeavors. Are first time freshmen required to take a free course? Are these free classes limited to first time freshmen and transfer students? No. Any student can enroll in these classes. The course is only tuition free to first time freshmen. Upperclassmen will be charged for enrollment in these classes. Can first time freshmen students take more than the free courses? Does taking an online course satisfy the requirement to enroll in J-term? How do I know what other classes will be offered during J-term? J-term classes will be posted in Self Service Banner. Does participation in a GO mission trip satisfy the requirement to enroll in J-term? What are the dates for J-term? Residence Centers open Wednesday, January 2. Classes begin Thursday, January 3. Final examinations are administered on Friday, January 25. How many hours can a student take during J-term? Five credit hours is the maximum a student can take without permission from his or her dean. What is the cost for J-term? Tuition for J-term is $628 per credit hour. If any student lives in the residence centers during the fall and spring semesters, J-term housing is provided at no cost. The only other cost to students will be a meal plan, books, and course fees. 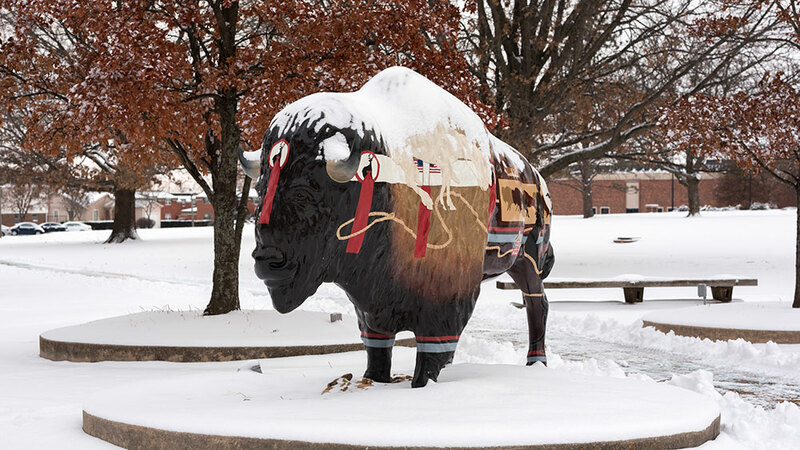 The 32 Block Meal Plan with $25 Bison Bucks for $315 and 44 Block Meal Plan with $15 Bison Bucks for $395 for students in the residence centers. The meal plan (15 meals and $25 Bison Bucks) for those staying in apartments is $195. Three classes are offered tuition-free to first-time freshmen. How do I qualify for the housing scholarship? Students must live in the residence centers during the fall and spring semesters to qualify for the J-term housing scholarship. Charges will appear in Self Service Banner after enrollment. The housing scholarships will be applied for enrolled students on Tuesday, January 8. When will I be billed for J-term? Charges for J-term enrollment can be seen on Self Service Banner after enrollment. Charges are not due until January and may be rolled into the Spring payment plan if enrolled by December 7. Housing scholarships will be applied for enrolled students on Tuesday, January 8. Student Financial Services counselors are available to assist students with financial aid questions. Specific financial aid is not available for J-term. However, each student represents a unique situation. The SFS counselors can guide the student through this process. What if a student still has a balance due and a hold on his or her account? The Student Success Center works very closely with students during the enrollment period as a part of the recruit back efforts. SSC identifies the reasons a student has not enrolled for the upcoming semester including financial holds. If a hold is the only reason a student has not enrolled for J-term, SSC will work with the student, Academic Center, Student Financial Services, and the Vice President for Academic Affairs to facilitate enrollment in the free J-term classes.